Describing the proposed gold deposit scheme as ‘game changer’, the State Bank of India's economic research department has said it will help attract at least Rs 1 trillion in deposits on the precious metal. 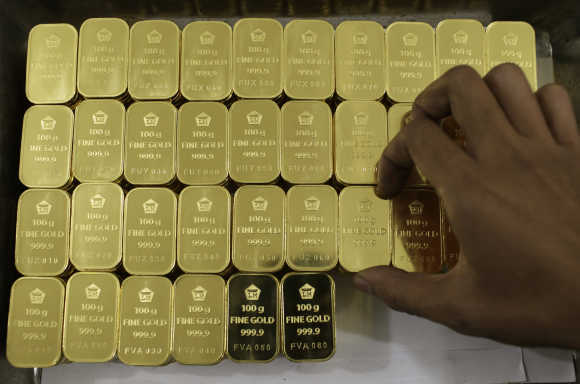 "The proposed introduction of a gold deposit scheme is a big positive and conservative estimates show that the monetary value of gold deposits mobilised may be at least Rs 1 trillion," it said in note on Sunday. It will be a ‘game changer’ by incentivising the banks to hold a part of the deposits as part of the mandatory cash reserve ratio or the statutory reserve ratio. This may free up resources for productive or lending purposes, it said. The conservative estimates show even at a 30 per cent strike rate, the monetary value of gold deposits mobilised may be as much as Rs 3 trillion, it said. According to the note, the new scheme will help depositors of gold earn interest and jewellers to obtain loans on their metal accounts. In the Budget speech, Jaitley had introduced multiple measures to monetise gold, including the gold monetisation scheme, a sovereign gold bond and developing an Indian gold coin which will have the Ashok Chakra. "We are one of the largest consumers of gold in the world and import as much as 800-1,000 tonnes each year. “Though stocks of gold in India are estimated to be over 20,000 tonne, mostly this gold is neither traded, nor monetised," he said in the speech. It can be noted that these imports resulted in problems on the external front, where the current account deficit expanded which led to a heavy fall in the rupee.